Where ideas and action connect. 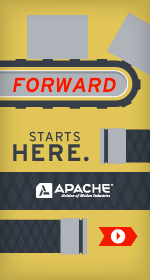 We are Apache … an organization run by hard-working people dedicated to helping you succeed. Partnering with our customers to add value to their bottom line, we are committed to delivering the best quality products and service — from custom solutions to product off the shelf — anytime and anywhere they’re needed. Our job is to keep our customers mission critical to their customers. Apache is widely recognized across the US for the variety and quality of our hose, belting, custom fabrications, on-site belting services, and consumer products. Pride in a job well done go into everything we do. From burst tests to tension checks, you can be confident that every product that comes from ISO-certified facilities will meet the toughest standards. We do what it takes to help our customer partners succeed. That’s the drive that has been part of the Apache culture, beginning with the vision of founder Bob South in 1963. Still headquartered in Cedar Rapids, Apache is now one of the largest belting suppliers in North America, a recognized partner in the agricultural and retail hose market, and a major manufacturer of molded and extruded rubber products. Over the more than 50 years of growth, the company has expanded from a regional supplier with a single location, to a nationwide company that sells throughout North America and in Europe. Supplying parts to both industry and agriculture, the founding vision has grown, and today we are a highly driven, global organization with locations throughout the United States. As we move into the future, Apache will play a more strategic role in industry leadership with the ability to provide a broader portfolio of products, OEM components, and custom-designed parts for unique applications. Our goal is to partner with our customers to help them grow their business. Every single day our work is about getting solutions to our customers — as quickly as it's needed. We’ve focused our business to best serve our customers, expanding our facility footprints to increase the resources we have to offer our customers. Part of our growth and expansion strategy has also been through acquisitions that have grown our hose, belting, and custom rubber product lines. In the future we will continue to grow where our customers need us the most. Sometimes it’s about geography. Sometimes it’s product breadth. Sometimes it’s capabilities. It’s always about our customers. When we connect leadership and partnership, our businesses flow seamlessly and work more effectively. Together we can reach our full potential — whether it’s faster lead times, more efficient processes, or more effective expenditures. Together we can find new ways to move business into the future. It’s time to think forward. It’s time to think Apache.